Posted on May 2, 2018 by Jessica T.
This was yet another book assigned to me in my English class this year. Surprisingly, contrary to the other books our class has read, I thoroughly enjoyed this one. Typically, I have a strong repulsive reflex to gore and all war related subjects. The discomfort my stomach feels and the immense sorrow I feel for fallen soldiers weighs my heart down. Remarque’s novel did just that but to my surprise, this book is one I’d read again. Nineteen year old Paul Baumer narrates the daily lives of him and his German companions as they experience the horrors of World War I. Technological and warfare advancements such as trench warfare, tanks and poison gas pose serious threat to these inexperienced young boys. Paul gives a detailed account of the inhumane living conditions and terrific attacks where every man’s life is on the line and chance is the determining factor if one lives or gets blown up. A reader gets to meet and befriend all of Paul’s closest companions: Kat, Tjaden, Kropp, Kemmerich and others that Remarque reveals are the only people in the world that can understand and love Paul. Together they flirt with girls in attempt to regain their innocence and connection of the world they left behind and together they fight to survive, not only to keep themselves alive but to stay alive to support and comfort each other. There are humorous moments and there are melancholic moments that all coalesce to make Remarque’s masterpiece. Like many war novels, the conditions and experiences sound absurd to civilians back at home. However, while majority of war novels glorify the bravery and heroism of soldiers, Remarque’s novel takes an opposing standpoint. War is not beautiful nor adventurous; war is a slaughterhouse that takes souls, strips them of innocence and leaves them fearful and desensitized. I love that Remarque chooses to focus on the negative effects of war and admonishes society for our constant exaltation of combat. Young children in our society have minds filled to the brim of the same ideals that Paul and his friends were taught in grade school. Their teacher, Kantorek, pounds patriotism into their young minds and shoves the hungry desire for glory down their throats. But the brutality of war destroyed any want to serve their country and gain homage back at home; Remarque desperately wants society to recognize his pleas of reducing war glorification. The loss of innocence and the admonishing of war glorification is only two of the numerous themes depicted in this work. There are touching themes of friendship and there are heart wrenching themes of the Lost Generation that make the reader reflect on humanity and the value of life rather than spurring the reader into an acclaim of warfare. Remarque’s work is bittersweet, providing immense catharsis but an unsettling question in the back of one’s mind. Is war worth the pain? Are those who survive wars really surviving if they come back home only to suffer from PTSD and detachment from a life they once lived? There is no other book I’d recommend to a reader who wants a gripping but thought-provoking read. 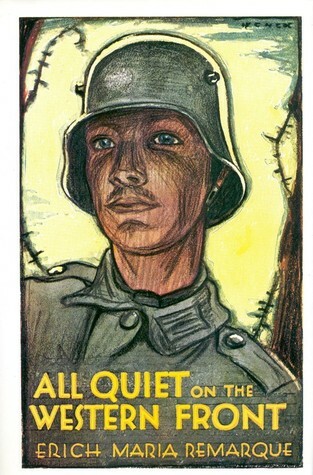 All Quiet on the Western Front by Erich Maria Remarque is availalbe for checkout from the Mission Viejo Library. This entry was posted in Book Reviews and tagged depiction of war, germany, historical fiction, reality check, war, world war i by Jessica T.. Bookmark the permalink.